The Energy Caper, or Nixon in the Sky with Diamonds takes you on a merry romp with a band of idealistic twenty-somethings looking for love and hoping to change the world in an luckier universe in which the Kennedys were not assassinated and the Vietnam War ended before it began. Joining in the fun are President Richard Nixon and Dr. Timothy Leary, the escaped convict Nixon calls “the most dangerous man in the world” for turning America’s youth into no-good hippies. This Nixon is the same profane, venal S-O-B that made him such a hit in our universe, but here he is unleashed in a world where there was no Vietnam war to slow him down and Watergate is just a fancy hotel. Elected on a pledge to wage an unrelenting “war on drugs,” Nixon instead confronts a different kind of war an energy war. The Arab oil embargo is driving the country toward a second Great Depression as motorists line up for hours to buy gasoline at any price. Desperate for alternatives to oil, Nixon learns of a plant which produces three times more biomass per acre than corn. If it were grown for methanol, good old wood alcohol ­the same fuel used in Indianapolis racing cars ­America could farm its way to energy independence in just five short years. A secret weapon has dropped in Nixon’s lap, but he is shocked to learn that, under another name, the secret weapon which could defeat the oil cartel is a primary target of his War on Drugs. If he can lead America to energy independence by convincing conservatives to legalize cultivation of the plant Thomas Jefferson called “America’s most valuable crop” in the name of national security, the final spot on Mount Rushmore will be his. Nixon knows that only a law-and-order, hippie-bashing conservative like himself could hope to buck America’s richest families and most powerful corporations to pull off a caper this crazy. Howard Zinn, Ph.D., author of A People’s History of America. Jim Hightower, author and radio commentator. Ralph Metzner, Ph.D., author of many books and co-author (with Timothy Leary and Richard Alpert) of The Psychedelic Experience. James Janko, author of Buffalo Boy and Geronimo. Jeff Meyers, producer, The Emperor of Hemp. Print versions can be ordered at your local book store. Print or Kindle versions available on line at Amazon.com. Print or Nook versions available on line at Barnes and Noble.com. Other eBook formats available at many retailers. Audio book available online at Audible.com. A tale of what might have been, and still could be. 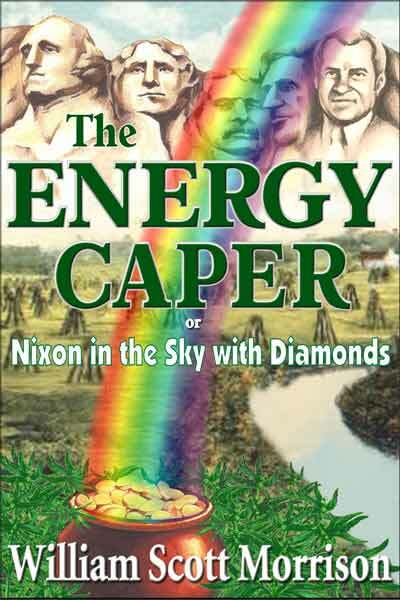 The Energy Caper, or, Nixon in the sky with diamonds / William Scott Morrison. 1. Nixon, Richard M. (Richard Milhous), 1913-1994–Fiction. 2.
development–Fiction. 4. Drug control–Fiction. 5. Nixon in the sky with diamonds.